It will take a bit more time to launch beta, we are currently just working on database and enjoying the closed beta. There are some more things to update and add something new to the current setup. We will give more informations through the month. I'm a Dota2 streamer. But I can stream for you guys for free =) Just to gain more players. Sounds nice, any info about the server version? level cap, etc. Finally we are ready to give you more informations about new upcoming server in early of 2018. We didnt decide about BETA and Offical date yet but it will be posted soon as possible. Our main point is to create long-term server which everyone will enjoy even oldest players. no more options to do than PK or merchant. We have included just III EXP Quest which should make this time more enjoyable. 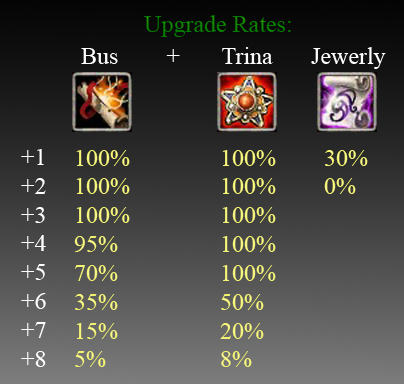 Here we've reduced all the prizes in-game to make goldbars something rare. We dont want everyone to have 10Gold Bars after week. easy to get so there wont be problems with upgrading. Low class & Middle class armors and weapons are easy to get. Our idea here is to see people runing more often in cleavers+8 than mirage daggers+7 for example. Same for Full Plates and Chitins. Middle Hight Class.Here it will be a bit harder to get items like Mirage Dagger,Glave etc. If someone make it +8 it will be rare. High Class.Its not impossible to get items like Shard,Raptor but if someone lucky will do it +8 he'll be god. Its our assumption of farmin to create it long-term not just for week or so. So thats it for now. Once forum and website will be fully ready we'll share it. Last edited by NothingMatters; 12-24-2017 at 08:17 AM. TurkishGameSupport and ThomasFuckingShelby like this. Erm, Why you open at early 2018? Me too haha. but my target is Malaysian,Indonesian and Singapore.. Can't dream too much to take overseas players. One day maybe with strong server and connections. Good luck on you server, Please do it not only for money. I like this concept waiting to try this out! Waiting for more informations since there is no good farm server at this version at the moment. We will add offical annocement within few days. Top 3 of all users win unique [BETA Winner] Ring. Enabled only for BETA winners. There may be some live contest once BETA begins , so dont miss it ! For more informations check our forum. Guide & Annoucement sections there you can find everything with specific explainations. Last edited by NothingMatters; 01-08-2018 at 01:22 PM. We will upload client few days before BETA to minimalize patches after people download it. you need to do your server become unique server.